DJzone DJ Magazine :: Martin EC-10™ LED Panels: For Ultimate Design Creativity! 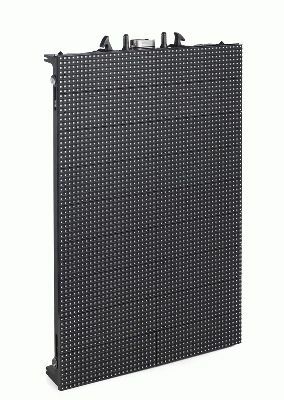 Martin EC-10™ LED Panels: For Ultimate Design Creativity! The EC-10 is a high performance, true 10 mm pixel pitch LED display panel from Martin Professional that teams with Martin’s EC-20 to form a fully compatible EC family of LED displays that can be mixed and matched for ultimate design creativity. Featuring the same award-winning, lightweight and cable-free design for rapid deployment, the EC-10 is 100% compatible with the EC-20 in terms of color, setup, curving, and control and processing, even accessories, allowing for seamless, mixed resolution visuals in one system. Using high efficiency Nichia LEDs, the EC-10 offers visual performance at the highest level. Pinpoint 48-bit color processing ensures uncompromised color depth at any brightness setting. Each pixel is color and brightness calibrated for maximum color and brightness uniformity and consistency from pixel to pixel and panel to panel. The EC-10 features 3000 nits of brightness, more than sufficient for any indoor use and bright enough for virtually any outdoor application, and operates completely flicker free thanks to a high 2250 Hz LED refresh rate. The EC-10 is fully compatible with the EC-20 LED panels in terms of mechanical construction, color points, power distribution, signal/data interface, processing and alignment. This allows both types of panels to be mixed within one screen with no need for separate processing, scaling, data-distribution or cabling. A key feature of the modular EC Series system is its ease of set up (and tear down) with no tools required for savings in time and hassle. The EC-10 panels are low weight (13.2 kg) for easy one man handling and the user-friendly design requires no separate rental structure. Integrated power and signal connections eliminate the need for cables between panels. Built to the highest standards, the EC-10 features an exceptionally stable and precise frame that ensures pixel perfect alignment in all directions, regardless of the size or shape of the screen. The EC-10 features a true IP65 protection rating, fully protected LEDs, and a wide operating temperature range for use in all types of indoor or outdoor environments. Essentially maintenance free, the EC-10 panels are completely convection cooled and use no fans which means no noise. A robust cast aluminum housing for electronics provides complete protection. The integrated curving mechanics of the EC Series allow users to create curved screens while maintaining an accurate pixel pitch with no gaps between curved panels. The EC-10 panels support stepless curving down to 15 degrees concave. A range of useful accessories is also available for even more creative layouts. The EC-10 is driven by Martin’s innovative and award-winning family of P3 System Controllers, ultra robust units for advanced video signal processing and integration with lighting control. The P3 processing system makes setting up an LED screen a true “plug and play” experience. Based on Gigabit Ethernet and Cat5e wiring, P3 technology removes the limitations of video-type protocols for easy connectivity and speed of set up.